Walk-A-thons, Bike-A-thons, Run-A-thons, Jump-A-thons are simple events that have a two-fold purpose. 1. raise money and 2. get kids active while having fun. Download a kit of sample materials to run your next event. (Pledge sheet, parent letter, business sponsorship, and sample rules for the event). Pack of materials for running a walk-a-thon. So you want to learn how to “bag the junk” at your school? Then check out Bag the Junk website which is an informational website to support the NEA Health Information Network’s Healthier School Food Advocacy project. The goal of our website is to educate school employees and other members of the school community about the effects of selling unhealthy snack foods and beverages to kids in schools, and how to do something about it. Schools should be places where healthy eating and regular exercise are common. This guidebook aims to help schools find fundraising options that meet their needs. Yes. You Can. 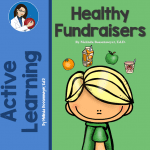 A fresh look at healthy food fundraisers for schools. According to Alliance for a Healthier Generation use these 10 ideas to get inspired and try healthy fundraising with your school community. Healthy Non-Food Rewards and Fundraisers Healthy food or non-food fundraisers enable schools to send consistent, positive health messages, reinforce classroom education and contribute to student health. Active fundraisers go even further, providing students and families with opportunities and positive reinforcement for increasing physical activity. Healthy food and no-food fundraisers enable schools to send consistent messages regarding good nutrition. Alternative Fundraisers to Unhealthy Food. Looking for alternative fundraisers to unhealthy food? Here are some ideas for fundraising not associated with food. Children in Balance created this list and they have designed and implemented in- and after-school curricula, planning guides, and toolkits to assist parents, teachers, pediatricians and community leaders in creating an environment that promotes healthy eating and active living. IT’S TIME TEXAS, a 501(c)(3) nonprofit, is a first-of-its-kind cause organization that empowers people to lead healthier lives and build healthier communities. Simply put, we make healthy easier. Join us to access and share free tools, information, and local, healthy connections. Donors Choose is a site designed for teachers. It states, “Teachers ask. You choose.” DonorsChoose.org makes it easy to help classrooms in need. Public school teachers post classroom project requests which range from pencils for poetry to microscopes for mitochondria, according to their website. The mission: DonorsChoose.org engages the public in public schools by giving people a simple, accountable and personal way to address educational inequity. Donors can browse the requests in a digital database and make a contribution, with the option of giving an additional donation to DonorsChoose. The extra donations cover the operating expenses for the nonprofit company. Once a project reaches its funding goal, DonorsChoose delivers the materials to the school. AdoptAClassroom.org partners donors with teachers so you can have funds to purchase critical resources and materials for your classroom. By registering, your classroom will be posted on the AdoptAClassroom.org website available for donors to select. When adopted, you will have full discretion to purchase items that meet your unique classroom needs. Wish lists let you see what is needed and support any school teacher, coach, band, team or PTA/PTO.